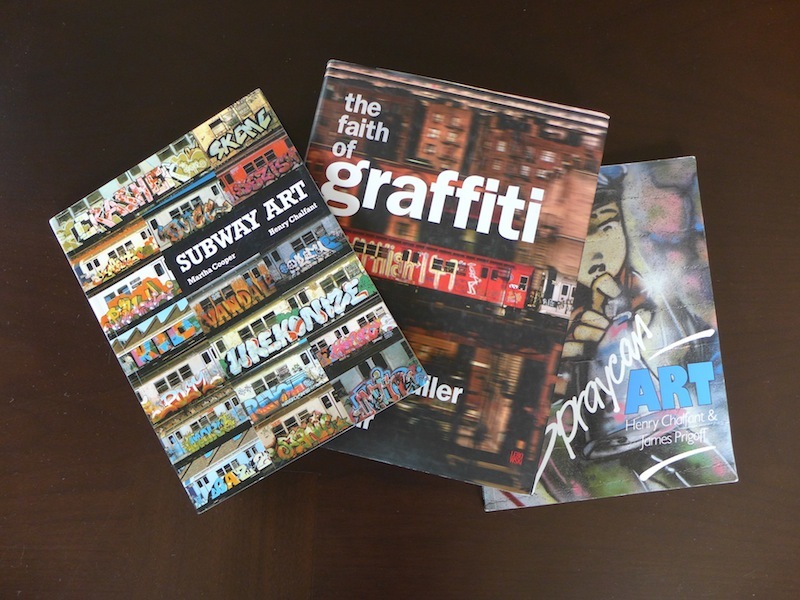 Subway Art, The Faith of Graffiti and Spraycan Art, three of the earliest and best-known books on graffiti. Photo by Mike Rushmore. Any graffiti writer, or graffiti aficionado for that matter, will tell you that graffiti has been around for thousands of years. They’ll tell you how even on the walls of Pompeii you can find graffiti, and that man has always had the urge to say, “I was here.” Graffiti historians and academics will say that graffiti became the graffiti we know today in the 1960s or 70s, but 1984 was a special year for graffiti. That was the year that modern graffiti (so called hip hop graffiti) truly escaped New York City and seeds were planted for this new style of graffiti to spread around the world. There have been books, newspaper articles and films about graffiti before, but 1984 was the year the book Subway Art was published. That book, by Martha Cooper and Henry Chalfant, which has now sold over half a million copies, accidentally spread New York’s subway graffiti around the world and has defined it to this day. While the book only featured a small segment of the graffiti on New York subway trains during the years that Cooper and Chalfant were photographing and an even smaller segment of the graffiti created on New York trains during the entire existence of subway graffiti, the two photographers captured some amazing work. Because the pieces in their photographs were the portion of New York graffiti that people outside of New York got exposed to, those pieces have come to define New York’s subway graffiti for generations of kids who never saw a freshly painted wholecar in person. What exactly did Cooper and Chalfant capture? There’s no denying that they shot some of the era’s masterpieces. Wholecars on the New York City subway system like Dondi White aka DONDI’s Children of the Grave part 2, Richard Mirando aka Seen’s Hand of Doom and Leonard McGurr aka Futura’s Break Car have rightfully continued to influence writers, street artists, and designers to this day. As the photographs of those cars and the others that Cooper and Chalfant published spread around the world in Subway Art, the styles spread with them and began to show up in the graffiti that appeared on previously pristine walls in cities everywhere. The photographs in Subway Art were taken by Chalfant and Cooper in the late 1970’s and early 1980’s, and most of the photos were taken not across the entire city but in a select few locations. As a result, the book only shows work that appeared on only a few train lines. In fact, it was the writers who connected Cooper and Chalfant, who had started out photographing graffiti separately unaware of each other. Cooper and Chalfant photographed some amazing artwork, but they missed more than they documented. Both Cooper and Chalfant lived on New York’s West Side. While this might not have deterred them from traveling all over the city if they had envisioned themselves as the primary archivists for one of the greatest art movements in their lifetimes, that’s not how they saw their projects. Cooper mostly shot the #1 and #2 trains, because the Bronx was the easiest place for her to get to where the trains ran above ground. She was interested in figuring out what graffiti was and how it was done, not trying to archive the work of an entire subculture. Cooper was trying to get good photographs of graffiti on trains and frame each of those trains with a unique contextual location. She was thinking like a photographer, not an archivist. As a result, trains that were painted on other lines could go unphotographed, except perhaps by the occasional writer with a cheap camera, and many of the photographs that Cooper did take remain unpublished in her archives. Sometimes the reason for not photographing a car was an aesthetic choice, like not shooting “ridgies” in Brooklyn because the outsides of those trains were not as flat as the trains on the #2 line, something many writers also took into account when they were deciding which trains to paint and which to avoid. Whereas trains on the #1 line turned around so that Cooper could stand in the same place for 3 hours and see both sides of every train running on the line, the #2 trains just got to the end of the line and then reversed direction. For pieces painted on that line, the clever writers knew to call up Cooper and tell her that they had painted a train and that their piece would either be on the morning side or the afternoon side, depending on when the light would be ideal for photographing it. If the writer painted a different line or didn’t give Cooper the proper heads-up about something they had done, that piece might never be photographed. Because Cooper in particular was trying to create powerful photographic compositions showing New York City graffiti, she made choices based on conceptual and aesthetic considerations that may have not been about the graffiti itself. Unintentionally, those choices have gone on to influence graffiti history. Cooper only wanted to publish one photo of a train against any given background, but she took many photos at each location. Perhaps there are trains that would be iconic and would have been influential, but they were photographed at the same location as McGurr’s Break Car and so they were not included in Subway Art and have never been shown publicly. But Cooper’s decision to only publish one train on any given backdrop and only publish extremely high-quality photographs also may have contributed to making each of those images that she did choose to publish even more iconic. Of course, there were also uncontrollable factors that prevented some cars from being photographed despite the writers informing Chalfant or Cooper and painting the work on one of the “right” lines. Obviously weather limited things, and there were writers like CAP who would paint over brand new pieces just because that was his style. Perhaps the most frustrating misses for Cooper were when she would set up a shot, wait for hours, and then right when the train she’d been waiting for would come her way, another train would come from the opposite direction at the same time and block her shot. If something out of the writer or photographer’s control happened, maybe there would be another chance to photograph it, or maybe the train would be buffed or written over the next day, the artwork gone, forever undocumented. The vast majority of NY subway graffiti was not documented, but the writers that Cooper and Chalfant knew did like to have their work photographed if possible. Besides telling Chalfant and Cooper about their latest pieces, some writers tried to take their own photos when resources permitted. According to Cooper, particularly savvy writers like Blade would even plan when they painted their best pieces around when they had access to a camera and film. Once the writers saw what Cooper could do, they jumped at any opportunity to connect with her. “Part of my entrée was having a camera and giving good pictures to people,” says Cooper. While Chalfant began by photographing the trains and then he met the writers, Cooper was drawn in by the writers and first thought that the graffiti she was shooting was simply another example of kids being creative, not art history. HE3 and DONDI, her first two connections in the graffiti world, both had an interest in keeping pigeons as well as writing graffiti, and in an early interview with Dondi, Cooper asked him as much about keeping pigeons as she did about graffiti, despite DONDI being one of the greatest writers of his time. It took Cooper some time before truly realizing the potential of what she was capturing on the trains. Before Subway Art, there had been another key book in the graffiti canon, but it took decades for it to surface as a valued piece of graffiti history. Jon Naar’s photographs of graffiti were accompanied by an introduction by Norman Mailer in the 1974 book The Faith of Graffiti (the essay and a few of the photos were also published in Esquire magazine). Whereas Cooper and Chalfant photographed what can loosely be described as the second generation of modern graffiti, Naar photographed some of modern graffiti’s beginnings. No, he was not there to capture the very first tags of JULIO 204, but Naar did photograph other work from an era where graffiti was really just beginning to take shape as an artform. Most of the work that Naar documented would not be considered beautiful or particularly skillful, but there were signs that graffiti was moving in that direction. Still, even with the right distribution, The Faith of Graffiti never could have inspired a generation as Subway Art did. Naar knew some writers and Mailer’s essays shows a much greater level of understanding than most adults will ever have of graffiti, but the photos in The Faith of Graffiti were taken over the course of a few weeks, so the writers whose work was captured may or may not have actually been representative of what was happening on the street at the time and what was most important. Naar, like Chalfant and Cooper for the most part, was trying to show a culture in broad strokes, not elevate a few kings to the level of superstars or photograph a definitive history. It is only now that we can look back and say, “Well thank God that Jon captured that Stay High 149 piece.” Naar documented some of the first graffiti, so graffiti nerds and cultural anthropologists and the like will surely appreciate his work as an invaluable archive, but Chalfant and Cooper succeeded on a much more significant scale because they were photographing in an era when graffiti was truly and undeniably art on par with anything in an art gallery. The Faith of Graffiti’s lack of success early on actually deterred the publication of Subway Art, despite being nearly a decade apart and extremely different in their content. Many publishers whom Cooper and Chalfant approached just could not see or did not bother to see the difference between the early graffiti in Naar’s work, and the masterful art found on nearly every page of Subway Art. Luckily, Thames & Hudson, a British publisher that now regularly publishes books on street art and graffiti, saw potential in Cooper and Chalfant’s proposal for Subway Art and agreed to publish the book. The struggles that Chalfant and Cooper faced in getting their project published, resulting in a British publisher for Subway Art rather than an American, may have actually helped to make the book more influential since it ended up in cities across Europe. A publisher in New York may not have had quite as strong distribution networks there. After Subway Art was published in 1984, it acted as the catalyst for graffiti movements in nearly every major city where the book could be bought. As Chalfant and James Prigoff’s 1987 book Spraycan Art would show, graffiti went from being largely an anomaly of New York, Philadelphia and Los Angeles in 1983 to a global phenomenon in less than 5 years. Among writers, Subway Art became known as The Bible, as it spread the good news of graffiti worldwide and also acted as the best rulebook available, introducing new writers outside of New York City to just what graffiti was and how it was done. What Cooper and Chalfant envisioned as an art or photography book or perhaps a bit of New York culture to share with the world was taken by kids as an instruction manual and some of the best inspiration they could hope for. Before Subway Art, even if kids outside of NYC had heard of modern graffiti, they were highly unlikely to have seen many examples of it, except for very occasional magazine articles or work by writers who moved from New York to other cities and brought a bit of graffiti with them. Subway Art probably contained more modern graffiti in its pages than many individuals outside of New York would have seen in their entire lives, particularly if they were young like most graffiti writers and unable to travel extensively. After Subway Art, nearly every city that the book appeared in began to have a graffiti “problem” that looked a lot like New York-style graffiti, but each city quickly developed its own distinctive styles. Martha Cooper photographing Os Gêmeos at Houston Street in 2009. Photo by Dani Reyes Mozeson. Perhaps the quintessential story of Subway Art’s influence and the rabid cult-following it developed is that of Os Gêmeos, the twin Brazilian graffiti writers whose work has dominated the streets of São Paulo since the 90’s. While not to undermine the influence of local graffiti on Os Gêmeos (São Paulo actually already had comparatively well-developed street art and graffiti movements as early as the 1970’s), Os Gêmeos became interested in hip hop and got into graffiti through that, so New York’s influence was always there to an extent as well as something that they longed for more access to. The twins first saw a copy of Subway Art in 1988. According to Cooper, their mother was an English teacher and the young boys had her translate the text in the book for them over and over. They found a copy of Spraycan Art around the same time, and those books were both an early influence on their graffiti. But it was not until meeting Barry McGee around five years later that they first saw the film Style Wars or any American graffiti zines. In the years between getting Spraycan Art and meeting McGee, they (like most of São Paulo’s writers) were more or less out of the loop when it came to what was going on in American or global graffiti. Without Subway Art, it seems unlikely that Os Gêmeos would have taken up graffiti when they did and done what they have subsequently done, but their access to more information was so limited that the further development of their graffiti and graffiti in São Paulo generally took a uniquely Brazilian turn, which only reconnected with the global graffiti community in the mid-1990’s thanks to magazines and writers who traveled to Brazil (more on that later). While the story of Os Gêmeos is perhaps the most obvious example of Subway Art’s influence, there are countless similar stories from just about any city where Subway Art could be found in the 1980’s. Before kids in Norway could look up the latest Los Angeles graffiti with the click of a button, before zines were traded around the world or graffiti hit freight trains and traveled along those national networks, before hip hop magazines began to include a page or two of graffiti in the back of each issue, images of graffiti were hard to come by. Exceptions like Subway Art, Wild Style, Spraycan Art, and Style Wars planted seeds in practically every city where they were available, and a somewhat connected and certainly global graffiti movement was born. With all of these projects, their creators could have little conception of their future influence, and choices that were made for a myriad of reasons besides the sake of historic preservation have subsequently painted a somewhat skewed picture of graffiti in 1980’s New York City, a picture which was subsequently taken as gospel and imitated by young writers across the globe. There is little doubt that the worldwide graffiti movement could not have developed in such a short time frame, if at all, without Subway Art and a handful of similar projects.